Fantastic looking, and looks great in our space. Bring the spa home with this VIGO bathroom sink collection, featuring the distinctive oval-shaped VIGO Wisteria Matte Stone Vessel Bathroom Sink. 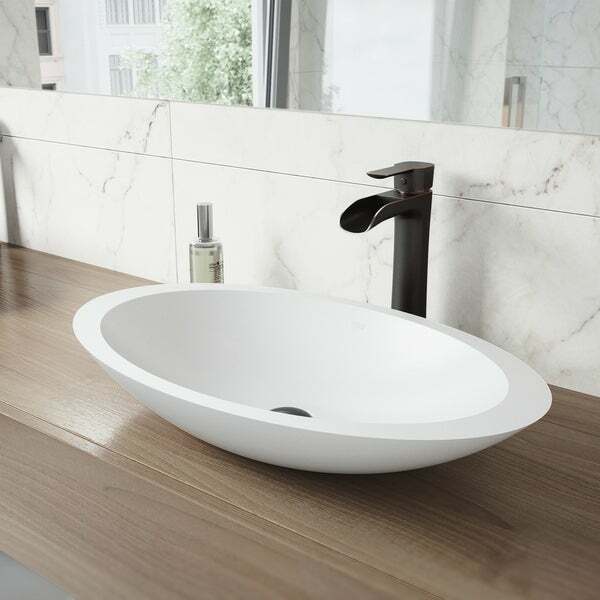 Crafted from VIGO's signature Matte Stone PMMA composite, this sink is built to last, with a solid-core design that prevents unsightly cracks or scratches. Add to the relaxation with the cascading VIGO Niko Vessel Bathroom Faucet, finished in a rich antique rubbed bronze. The faucet's unique waterfall-style spout will delight you with every use. Also features a matching pop-up drain.